Ajaita is the Founder/CEO of Frontier Markets and the President of Frontier Innovations Foundation. She has been working in India for 11 years in microfinance and clean energy distribution. She is a 2006 Clinton Service Corp Fellow, 2012 Echoing Green Fellow, 2013 Cordes Fellow, has been awarded the most influential award in Microfinance for people under 30, and Business Week's 30 under 30 award, and most recently, Forbes Magazine’s Top 30 Under 30’s Social Entrepreneur of the Year. She has been recognized as the #3 of top 40 women entrepreneurs of India in 2014, Nasscom Foundation identified her as Women 2.0 of 2015, and National India Conclave’s Women Entrepreneur of the Year 2015. She has received Loreal’s Women of Worth 2016, CNBC Young Business Women of the Year 2016. She actively speaks at conferences for the US Green Business Council, Universities, global forums. She has been an active educator, collaborator, and catalyst in helping scale clean energy access globally. Ajaita serves on the board of Frontier Innovations Foundation, a non-profit focused on last-mile distribution support for clean energy companies. 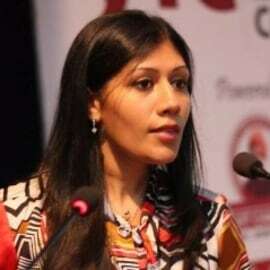 She is also an advisor to various social enterprises in India focusing on product development for the poor. She is an active member of the UN Practitioner’s Network, Asian Development Bank’s Energy For All Partnership. Ajaita Shah holds her B.A. in International Relations from Tufts University.